I used to read voraciously. There was nothing I liked better than whiling away a sunny afternoon or chilly evening with a book in my hand, the bigger and more obscure the better. Pynchon was crack to me in those days, and I tore through his books like a wildfire. Once I met my wife, though, I cut down on the freetime reading – not due to any request of hers, simply because I preferred spending time with her to spending time with the books. Instead I made a point of continuing to read while commuting to work, since I was (at the time) looking at about an hour and a half in both directions via bus, elevated train, and train lines. I read a lot of good history and classic literature in that way, from the history of the Mediterranean and Tacitus to the French Revolution and Dumas. Those were excellent days, and even waiting for the train was made easier by access to these other worlds. When we moved out of the city proper, though, the reading more or less stopped cold. Lack of public transportation and less time free at the house added up to a lot of difficulty in making the time for my old friends, the books. That’s why reading constitutes a decent portion of the 1001 Nights for me – these are all books I’ve desperately wanted to read since moving out, and (due to their weight and the time commitment) have not been able to. 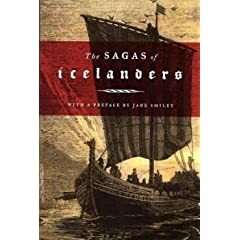 Last night I started on Egil’s Saga, from the Complete Sagas of the Icelanders. I see now how accurate the Monty Python sketch, Njorl’s Saga, seems to be – I’m on page 36 and so far I haven’t even met Egil yet. But then, starting out with a list of names and accomplishments also works to spin me back into the very place I want to be. It’s a recognized convention from the heroic past of literature which makes me more aware than before that I’m embarking on something out of the ordinary with this task. I also went ahead and ordered Crow: From the Life and Songs of the Crow, Ted Hughes’ homage to my favorite animal. The poems I’ve read from this selection so far disturb and thrill me, which is another very good thing. I want to feel this one, not just peruse it. I figure it should be in my hands by March, which gives me a good amount of time to devote to the Icelanders for a while. This entry was posted by Ivan on February 2, 2009 at 8:34 pm, and is filed under Uncategorized. Follow any responses to this post through RSS 2.0. Both comments and pings are currently closed.